A series by Pratibha Jain about silvers who believe nurturing the body and mind is the key to joy. The serenity and finesse with which she runs her household are truly admirable. Although she grew up in Maharashtra, Vijaya Mehta’s love for Rajasthan is palpable; her charming residence at the heart of the Pink City bears testimony to this fact. Sadhana Chordia, who initially introduced us, was right in describing the 64 year-old as a “beautiful lady in a beautiful house”. The lentil snack and sweet cheela she served us not just tasted authentic but had a timeless quality. Here are some snippets from the conversation, translated into English. I grew up in Yavatmal in Maharashtra but moved to Beawar in Rajasthan after my marriage at 15 to Virendraji Mehta. There were many differences between our two families but being young, I adapted easily. While most Rajasthani women during those days wore the traditional ghaghra-odhani, my husband’s family did not follow this tradition. In fact, my mother-in-law used to wear elegant organdie and chiffon saris, accessorised with sunglasses. My mother-in-law was friendly with members of Rajwada royalty. Hence, their lifestyle and influence seeped into our house as well—right from the way we dressed and our cooking style to how we pampered ourselves. The manner in which the staff was trained to serve the guests and speak with utmost respect in beautiful Marwari dialect was reminiscent of the corporate staff training you see in hotels nowadays. I still remember how my mother-in-law gently groomed me into paying attention to details. She left such a deep impression on me that over the years, even after we moved away from Beawar, I continued to do a lot of things the way I learnt from her. Traditions of food revolve around recipes as well as mannerisms and etiquette. The working staff at our house commanded as much respect from the youngsters as the household elders. For generations, the staff would continue to work in the same households, with their growing loyalty and familiarity becoming a major factor in commanding respect. We have a son, two daughters, and four grandchildren. Whenever my son visits, I make it a point to make his favourite bhindi ki sabzi. Both my daughters love all varieties of porridge: ghaat and kheech. 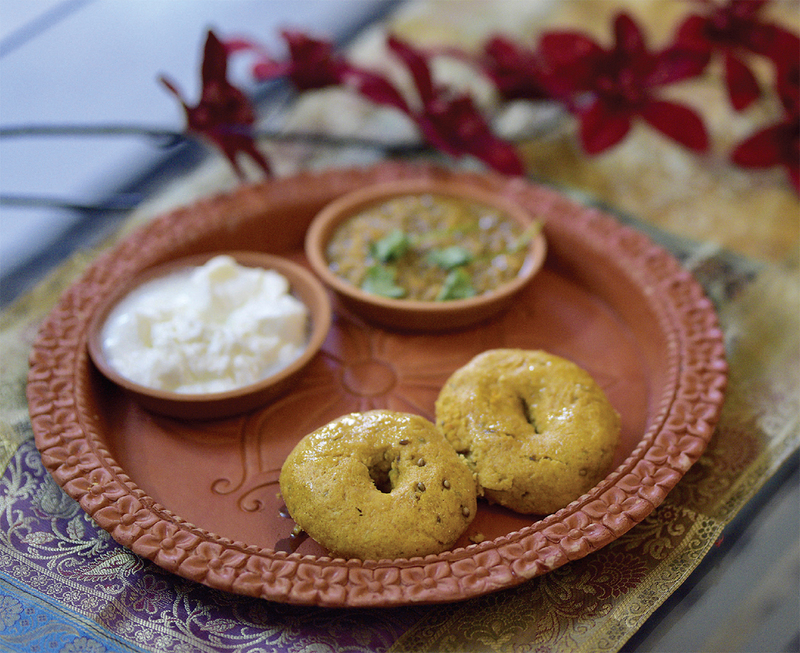 Gatte ki sabzi and dal baati churma are all-time family favourites. For the grandchildren, along with these traditional dishes, pastas and pizzas have become a part of their food preferences. Change is inevitable; how graciously we change is all that matters. Because we maintain a full stock of ingredients, fruits and vegetables, cooking at short notice is never a problem. A range of delicious parathas and cheela can be made in no time. We also have a wide variety of homemade pickles and powders that can serve as accompaniments to upma, rotis or even bread. We stock masalas for the whole year. When fresh masalas arrive in the market, I go and visit the famous Jaipur mandi where you find the finest spices. I really like the Jaipuri red chilli powder as it’s not very spicy and lends a rich colour when added to a dish. Along with spice vendors, you will also find women who will clean the spices for you and others who will grind the chillies, turmeric or coriander seeds on the spot for you. Makki ke parathe: A family favourite is makki ka ghaat (corn porridge). With the leftover ghaat, we make parathas that are delicious. Simply mix any combination of flours and masalas in the ghaat and make into a dough. As these parathas tend to be sticky, wrap the balls in a plastic sheet and roll them out. Roast on a tava with oil and serve. Radish sandwich: Use radish stuffing left over from making parathas to make a sandwich. Simply put the stuffing between two slices of bread and toast until golden. Serve hot with green chutney or tomato sauce. Bajre ka upma: Transform leftover bajre ka daliya (bajra porridge) into delicious upma. Sauté chopped onions, green chillies, ginger and tomatoes (optional). Add the daliya and garnish with coriander leaves. 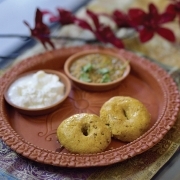 In Rajasthan, millets such as bajra, makki and jowar are used predominantly in preparing a delicious range of sogra (thick rotis), dhokla (dumplings) and ghaat (porridges). Enjoy this simple and tasty dhokla recipe using maize flour. Mix together the maize flour, salt, cumin seeds, papad khara and coriander leaves. Add enough warm water to make into soft dough. Knead well. Roll into dhokla of 2.5 to 3 inches diameter with a hole in the centre and place on a shallow vessel with perforated holes. Line the vessel with a clean muslin cloth, large enough to fold over the dhokla. In a pan, add water and bring to a boil. Keep a small base (steel ring) in the centre and place the vessel with the dhokla on top. Cover with a lid. Steam for 10 minutes on high flame, then another 20 minutes on medium flame. To check whether the dhokla are cooked, insert a knife; if it comes out clean without the batter sticking to it, they are done. Switch off the flame. Serve hot with ghee and sugar, or with moong ki dal.